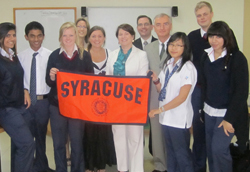 Syracuse University Project Advance (SUPA) anticipates going global in 2011, starting in the Middle East. Administrative team members Jerry Edmonds, Sari Signorelli, John Fiset and Chris Parish recently visited several Global Education Management-owned high schools in Dubai to assess their potential to offer of SU courses. Flagship Education, a Dubai-based company dedicated to bringing concurrent enrollment to high schools around the globe, hosted the visit. SUPA would be the first program in the nation to bring university courses into high schools outside of the United States. Initially, the pilot program will run in select schools throughout the United Arab Emirates, focused predominantly in Dubai, with potential expansion throughout the Middle East, North Africa and Turkey in subsequent years. “The global expansion was a natural extension of SU’s commitment to serve the public good through academic excellence and engaging the world, “ says Edmonds, director of Project Advance. Expanding globally not only brings SU courses into high schools outside of the United States, but also brings teachers from around the world to the Syracuse campus for the SUPA Summer Institute, where they will train to teach the SU courses. Teachers from the United Kingdom, India, Australia and other nations who currently teach in UAE high schools will join the U.S. teachers at this year’s Summer Institute, providing opportunities for exchanges of best practices from internationally recognized secondary curriculums, as well as forging international learning communities. SU courses being offered to students in the UAE include biology, calculus, chemistry, economics, English/writing and psychology.